50 meters from the port, known since ancient times, founded by the emperor Trajan, a few steps away you can admire the cathedral of San Francesco D'Assisi which is the main church of the city built in 1610. The train station is only 900 meters away. Nearby you can visit the various archaeological sites, the museum and the famous daily market where you can find trivia, clothes and food. Before leaving, you can not miss a souvenir photo going down the stairs of the famous Porta Livorno! Bright and air-conditioned rooms of 16 square meters, elegant and minimal and sober design in which you access with custom codes, fully stocked with everything you need during your stay, made to give privacy, comfort and every comfort. The main room (Suite) has a balcony garden where you can have a drink with a view of the center. All rooms have an en suite bathroom with a shower, hairdryer, hygiene products and towels. At guests' disposal mini-bar, electronic safe, usb sockets, free wifi, suitcases, flat-screen LED TV, TV series, movies and satellite channels all over the world, smoke detector, emergency lights, comfortable mattress and memory pillow , on request an extra bed. Comfortable desks and comfortable chairs. Entrance door of high technology with fingerprint or numeric code of access, the living of 25 sqm, with informal atmosphere and charming window with superb view on one of the largest and most important ports in Europe, daily offers a breakfast service and snacks to start the day with a sprint, Nespresso coffee machine. It welcomes you a comfortable sofa with free magazines for the right break after shopping. Free wifi inside the structure. With our card you are entitled to a 10% discount at partner restaurants where you can taste their tasty fish dishes considered among the best in the city. Excellent location, nice room, great host. We were there for just one night, very pleased with the property. Wish we had planned extra time in Civitavecchia. Thank you for all, when you want you are welcome. Have a nice day. If you are planning to meet a cruise ship or return a rental car - this apartment is in the perfect location. PLUS it has every amenity you need. Breakfast items are provided and the apartment is clean as a whistle. I highly recommend Paolo's apartment. Thank you so much for everything's, you was the perfect guests for my b&b. I hope to see you again. 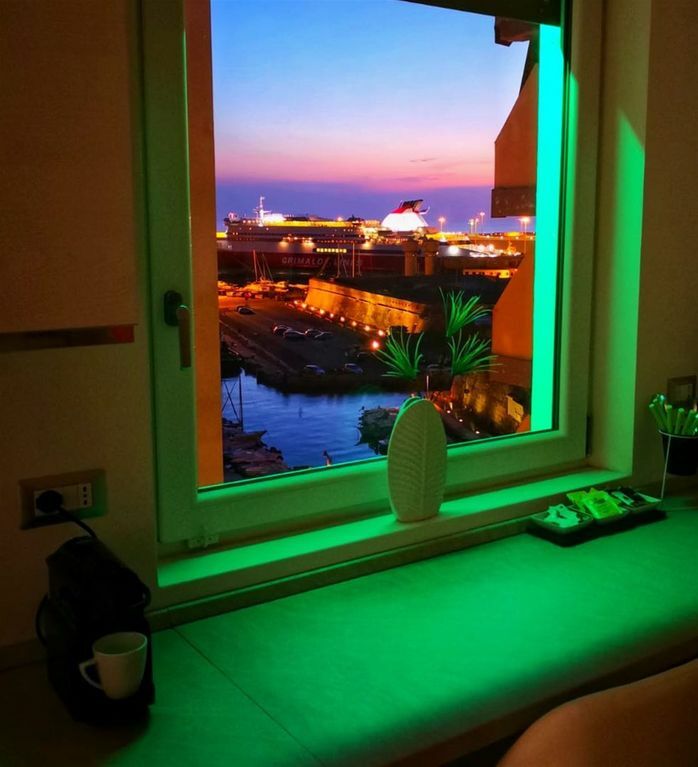 "La finestra sul porto", una piacevole sorpresa che ti invita a ritornare a Civitavecchia. Un ambiente accogliente, con tutti i confort,in un punto centrale della città. Le stanze ampie, pulite ed un ambiente comune con una bella veduta sul porto, ed un arredamento curato nei particolari. Grazie per aver soggiornato presso la mia struttura, è stato un piacere avere persone gentili e distinte come voi. Quando volete tornare siete i benvenuti.